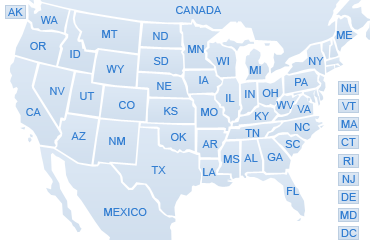 The United States covers nearly 3.8 million square miles, with 50 states and a wildly diverse range of cultures and climates. Melting pot that it is, the U.S. offers a little of everything, from tropical beaches in Florida and Hawaii to wild polar bears in Alaska. Whether you're heading down into the Grand Canyon or up to Denali, this country offers a seemingly endless range of options for explorers. Vacation rentals are as diverse as America's cities and towns, with metropolitan apartment rentals overlooking the Chicago skyline, adobe condos in Los Alamos, New Mexico, and rustic cabins in Estes Park, Colorado. You can step outside your accommodations to the sounds of traffic or the peaceful scene of wild deer grazing. This country has something for everyone. Orlando, Florida, is the most visited city in the United States. The state of Florida recently broke a record, welcoming more than 100 million tourists in 2015, and over 66 million of these went to Orlando. Orlando prides itself on being the "Theme Park Capital of the World." Walt Disney World alone is roughly the size of San Francisco, with four theme parks, four golf courses, two water parks, and two full-service spas. Orlando is also home to the Universal Orlando Resort, with its own pair of theme parks, and SeaWorld Orlando. New York City is the largest in the United States and a must-see for travelers who love metropolitan highlights. In 2015, NYC saw a record-breaking 58.3 million visitors. Book a vacation rental in The Big Apple, and you can spend your days taking in iconic sights like the Statue of Liberty, Times Square, Central Park, and the Empire State Building. Go shopping on Fifth Avenue, take in the modern art at the Guggenheim Museum and MoMA, take a spin on the Cyclone at Coney Island, or marvel over the architecture of St. Patrick's Cathedral. The National Parks System consists of 410 parks covering over 84 million acres in the United States. This includes historical parks and sites, national monuments, battlefields, military parks, preserves, recreation areas, seashores, lakeshores, reserves, and parkways. There are 59 national parks in the system. You can visit the highest point in North America at Denali in Denali National Park, or head to the lowest point in the Western Hemisphere at the Badwater Basin in Death Valley National Park. Explore the longest known cave system in the world at Mammoth Cave National Park, or gaze into the depths of the deepest lake in America at Crater Lake National Park. If you can't settle on just one vacation destination, why not book a string of rentals and head out across the country? US Route 6 is the country's longest transcontinental highway, running from Provincetown, Massachusetts, to Long Beach, California. If you'd rather go north-to-south, try US 1, running from the Canadian border in Maine to the southern tip of Key West, Florida. Further west, US 83 will take you from Manitoba to Mexico. The United States is packed with memorable destinations and unforgettable vacation rentals. Whether you want to look out over a bustling city or a tranquil lake, you can find a home away from home with the perfect view.